It's a bit stylish lately to wear a striped tie with a check dress shirt. Maybe not lately, but at least in the last year or so. It could be two. I am getting older and the time does fly. I have conglomerated that particular look a few times. Today I tried it with a windowpane shirt rather than a smaller check. I like today's conglomeration so well that I'm going to try the same, yet different in the near future. I also have the same dress shirt but in a navy, red windowpane. That one would take a little searching to find a red and navy striped tie. Maybe I'll look for one while looking for the other two on the "list". 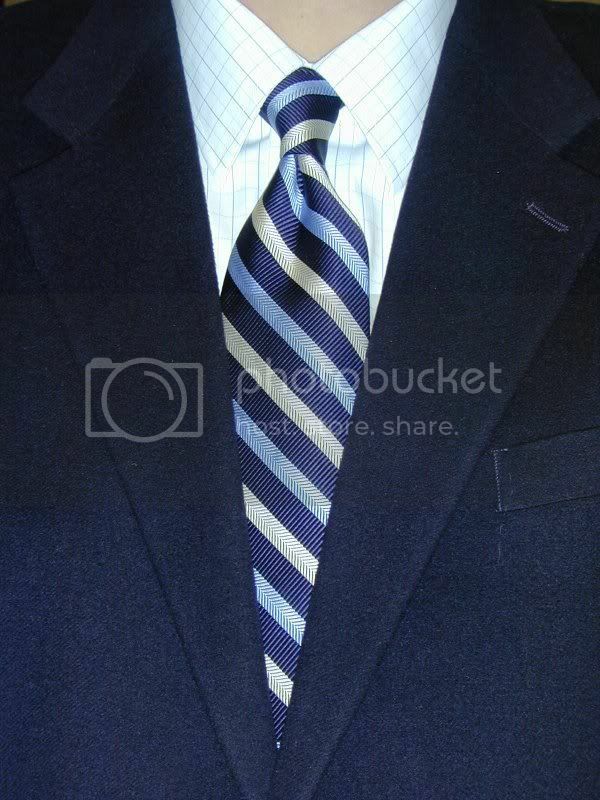 The tie is a Paul Fredrick navy, blue, white herringbone stripe. The three colors pick up the colors of the navy and blue windowpane stripes (?) on the white background of the dress shirt. Of course the navy sport coat was the obvious choice.